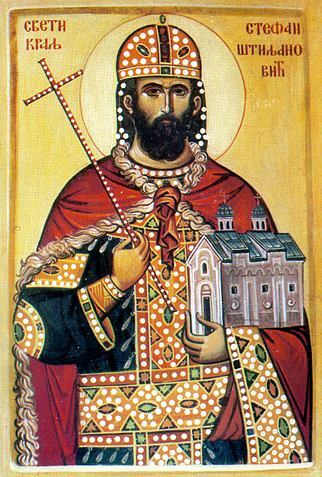 Saint Stephen (Stefan) Schilyanovich was born into a pious Christian family in the Serbian city of Zhupa (south side of Zakholm'ya). During this time Serbia was often subjected to incursions by the Turks, who devastated the land. Saint Stephen defended his native-land, doing military service in the army of the Serbian ruler. When famine began in the country, the kindly Saint Stephen distributed his own bread to the hungry. The patriotic activity of the saintly soldier was indissolubly bound up with his truly Christian life. He "ever aceticised in virtues, to wit: charity, purity, prayer, the Orthodox faith and unhypocritical love towards neighbour". The saint expired to the Lord on 4 October 1515. After a certain while the Turks saw over his grave a light. Thinking, that here was hidden treasure, they broke open the grave and found the incorrupt body of Saint Stephen. Serbian monks ransomed the relics from the Turkish pasha and transferred them to the Shishatovets monastery on Mount Phrushtsk. As a glorious righteous defender of his native-land, the Serbian Church prays thus to him: "Glory in the struggles, warrior Stefan Schilyanovich, great healer of those having recourse to thee in faith".